In 2010, New Mexico elected a Tea Party governor, Susana Martinez. She controls the state’s Game and Fish Commission. The reader will be able to gauge their attitudes quickly by their background and stated interests. Do they look like commissioners interested in any kind of carnivores or rare kinds of fish or animals? They are interested in deer and elk, period. There is one controversial exception. Unlike most states, New Mexico introduced a number of non-native exotic species from the Eastern Hemisphere. The stated purpose was hunting. The African oryx, or gemsbok is now well established. Persian Ibex were introduced and are beginning to expand out of the mountain range of introduction — the Florida Mountains. Barbary Sheep (from Africa) are now well established in part of the state. Oryx, a large African antelope, were introduced at the White Sands Missile Range and now have a population of about 3000. Oryx quickly invaded adjacent White Sands National Monument, requiring the construction of a landscape jarring fence, and a continuing program of removing the exotic from the national monument. Going down the exotics path is not likely for Idaho. Cattle and sheep growers will oppose anything that might eat forage that could go to livestock. Not unexpected, has been New Mexico’s relatively hostile reaction to the federal restoration of the small native Mexican wolf. Readers are probably familiar with the folkloric tales of depredations of the 20-30 or so of these 70-pound wolves. Meanwhile, there has been what amounts to an assault on the state’s native black bear and cougar. Intense trapping has more than decimated the state’s bobcats, fox, and ringtailed cats. Very large numbers of coyotes are, of course, killed; but that only causes even more coyote resiliencey due to the tremendous ability of that canid to recover and profit from high mortality. 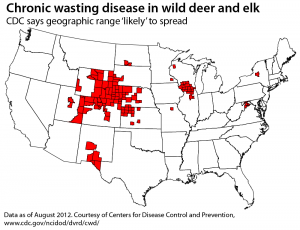 Not surprisingly for a state that emphasizes deer and elk, New Mexico has a problem with nightmarish chronic wasting disease (CWD) in the southern part of the state. CWD from the state is now spreading into Texas. Jan Hayes of the Sandia Mountain BearWatch has an interesting commentary today in the Albuquerque Journal on the war on New Mexico’s native carnivores and effects of trapping on smaller carnivores. Often the cure co-exists with the problem. Just as Sweet Fern can grow next to Poison Ivy, Mexican Gray Wolves are trying to co-exist with people and with Deer and can utilize the sickly deer into the food chain and remove the threat of CWD, all people have to do is leave the Wolves alone and let them do their thing. That was an excellent op-ed in the Albuquerque Journal. Yesterday’s tussle on this site over invasive species and ethical way control measures was timely. It’s stupefying that the NM Fish and Game intentionally introduced multiple non-native species for the intention of hunting without giving pause to potential long term problems.Add to the mixture what appears to be mismanagement of wildlife, and stacking the department and commission with the ‘good ole’ boys’, and it becomes a disaster waiting on the horizon. NM has plenty of experience contending with the invasive plant, tamarix. It’s a huge problem. I was on the Rio Grande banks near Isleta Pueblo a couple months ago, and the tamarix is everywhere. They’ve been fighting it for decades. Maybe these introduced animal species won’t be as difficult to control as the salt cedar. However, it does make me question if the image of state fish and wildlife departments as conservationists is nothing more than a marketing scheme. Who in their right mind intentionally introduces native species? And then, over hunts the native bears and cougars because they kill the introduced species? Add the long term drought, and the severity of the wildfires over the last three summers. In the last three summers NM has had the worst wildfires in their history. It looks to me that state wildlife management has no professional ethic at all, nor any environmental sense. It is simply bottom line for the managing agency and its full capture by narrowly focused hunting interests. It’s always interesting how states manage animals that are fun to shoot. https://www.facebook.com/StopGunhawkFirearmsCoyoteKillingContest?_ft_. The creators, one a lawyer, the other his wife a nurse have been doing excellent grass roots work to publicize and demonstrate against these contests. as anyone knows that does on the ground advocacy work, you unfortunately become aware of the myriad of other issues that also have a negative cumulative impact on wildlife. These people have been writing about, the issues in NM and doing a great job of making the BLM follow its rules about commercial uses on public lands as they relate to killing contests and of steering these contests out of New Mexico. I believe the big predator killing contest put on by predator masters decided to go to Arizona next year because of the bad press and efforts to oust them from NM by concerned citizens. Additionally, they do a great job of advertising the corrupt policies coming from Martinez office. They will be glad to see your story. Here are a couple of recent articles about members — and former members — of the New Mexico State Game Commission. Also, Jan Hayes’ Op-Ed is a great read. It’s no surprise that oryx are moving out of the WSMR. I’ve seen two of them well to the north of the WSMR. This is a 1963 Sports Illustrated article documenting the decision making in New Mexico that led to the introduction of the exotics from other parts of the world. Thank you for this informative background link and the links to recent N.M. wildife news. The Sports Illustrated articled is an interesting read. Interesting they wanted to import Arabian oryx. Whatever happened with the kudu they wanted to import? Thanks for writing about some of the issues facing New Mexicans. Maybe they should import lions and Elephants too. I have often though hippos would be a good way to control invasive plants in Florida, I mean if the Clovis point spears really caused the extinction of mega fauna in the western hemisphere, maybe New Mexico is on to something. Aren’t that “Canadian wolves” that have been illegally introduced into Idaho as big as lions and Siberian tigers anyway? They might eat the tigers.